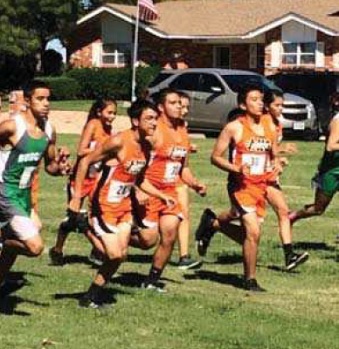 The Artesia High School cross country teams found themselves a bit shorthanded and, thus, unable to field full varsity teams Saturday at the Rio Grande and Wanda Dyer Memorial Meet in Roswell, but the athletes who were on hand still turned in overall solid results. “We were missing two of our varsity girls to a band obligation and two of our varsity boys, one to illness and the other to an injury,” head coach Shelley Ebarb said Saturday. As such, four girls competed for the Lady Bulldogs in the varsity race. Michaela Phipps and Kimberlee Bennett both broke into the top 10 with, respectively, a fourth-place time of 22:05 and a sixth-place 23:28. Katelynn Sullivan finished 17th overall with a 25:02, and Lexi Montgomery was 22nd with a 26:07. “The varsity girls are still looking solid, and the JV girls are improving weekly,” said Ebarb. The Bulldogs also had four athletes vying individually in varsity competition: Coy Moorhead (23rd, 20:51), Devon Harrison (30th, 21:56), Isaac Lopez (35th, 22:41) and Caleb Carnathan (38th, 23:30). “Senior Isaac Lopez ran for the fi rst time this season after suffering a sprained ankle before the first meet,” said Ebarb. “He’s just now getting back in shape, and hopefully he’ll get there by district. In the junior varsity girls’ race, Dania Jurado, Estefani Rodriguez and Deimy Dominguez delivered a cohesive performance, finishing third, fourth and fifth respectively with times of 27:27, 27:30 and 27:37. For the boys’ JV, Julian Martinez came in 11th with a time of 22:38, followed by Emmit Clark (12th, 22:46), Paul Ontiveros (15th, 24:19) and Martin Saenz (20th, 25:18). The Artesia varsity teams will now prepare for their toughest regular-season challenge Oct. 14 as they had to Rio Rancho for the annual Jamboree. “This will give the runners a chance to be on the state course,” said Ebarb.